Try now these beautiful daily disposable brown contact lenses that will enlarge your eyes. 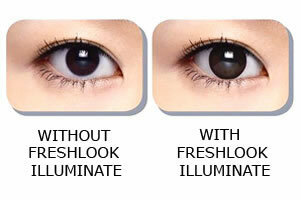 Freshlook Illuminate Rich Brown contact lenses are a lighter version of FI Jet Black lenses - they provide a more subtle effect perfect for people with light coloured eyes. Thanks to a brown ring, your eyes will look bigger and even sexier than normally. And what's more, you can wear them on a daily basis as they are availabe in corrective powers and are extremely comfortable due to Dailies manufacturing technolody.